Welcome to the Ford engine light Question and Answer Page! This page should save you some time from submitting a duplicate question and having to wait for a response. If you can't find the answers you're looking for here, feel free to submit your own question by using our "Get Help" link, or for immediate solutions, see our Wiring Diagrams page. We will include the model in most questions, so you can use the "Find on this page" function of your browser's "Edit" menu to get relevant info for whatever check engine light concerns you may have. For instance, just type in "Contour" and search for responses relating to this vehicle. You could also type in a Ford engine light code number by itself such as "P1381" to get all related responses for this trouble code. Just keep hitting "Find next" to go through all relevant check engine light responses. We don't recommend including a model year as this may make your search too narrow, and you may miss out on some relevant posts. Our Ford engine light resources cover a very wide range of concerns, but if you can't find what you're looking for through these links or our code listings, then visit the check engine light "Get Help" link on the navigation bar. As always, all repairs should be attempted only by a qualified individual. Please read our Disclaimer before getting started. Thanks for stopping in, and we hope you have found something helpful from our site! 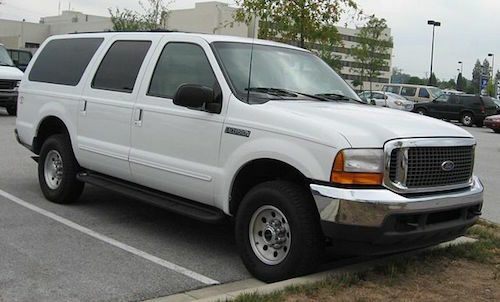 I have a 2004 Ford Excursion. Sometimes I will stop at a light or stop sign and when I go to take off there is no throttle response. I can mash the pedal over and over and nothing happens. Then, all of a sudden it will work again. I took it to a Ford dealer and they could not find any fault codes in the computer, and the Ford engine light was not on. Any suggestions? Thanks for submitting your Ford engine light question. I would ask the dealer if they are getting any continuous memory codes for the electronic throttle control system. We have seen a few instances of these having intermittent symptoms such as the ones you are describing. If possible, you may want to leave the vehicle with the dealer so they can monitor this system with the IDS (Ford's computer based testng system). If they can duplicate the concern while the scan tool is recording activity, they will be able to verify this hunch. There is also what is called a VDR (Vehicle Data Recorder) that some dealers have that can be put in the vehicle and released with the customer, so you can make a recording when the vehicle is having a problem. This is the most effective tool for very intermittent concerns. Hope this info is helpful! Thanks again, and let us know how you make out! Hello. I have a 2000 Ford Explorer with about 105,000 miles on it. I have the Ford engine light on and received codes P0171 system too lean, and P0174. I actually just bought the truck from someone a couple of months ago and so far have had the brakes replaced, air intake valve, power steering flush, and air filter. My car has been running fine since then so I am not sure why I am receiving those codes. I also have done a fuel injector cleaning. What do you think the problem may be? Thanks in advance for your assistance. Thanks for contacting us with your Ford engine light question! I would recommend reading our article on Oxygen Sensor Codes for a very thorough explanation of what to do about these Ford engine light codes. We will also be listing definitions on the Generic OBD II Codes page soon. I can also tell you from experience, when looking for vacuum leaks on the 4.0L engine check the intake gaskets thoroughly as these are known for leaking. Hope this info helps! Thanks, and enjoy the day! I have a 1998 Ford Contour. The code I have is P1381. It says Cam Timing Advance is excessive. What has to be done to get the Ford engine light off. The car runs fine I am having no problem with it. The mechanic says the distributor has to be changed to fix it. Before I get taken to the cleaners maybe you could help me. Thanks for contacting us with your Ford engine light question. I think I can help. This code indicates that there is a problem with what is called the Variable Camshaft Timing Solenoid. This does not involve the distributor, as your vehicle does not have a distributor! Ignition in this vehicle is computer controlled, and the PCM (computer) fires the coil based on inputs from various sensors, so a distributor is not needed. The VCT solenoid is used to adjust cam timing. This was done in an attempt to eliminate the EGR valve, but that is another story all together! Ford has actually released a Technical Service Bulletin for this specific check engine light concern, to help with diagnosis. The bulletin number is 03-15-14. I would call your local Ford dealer and ask them for a copy of this bulletin, most shops are happy to help out. A dealer's rate is a bit more per hour but they can usually fix it quicker and correctly the first time, so in a case like this it might be best to take it there. Most reputable independent shops also have access to this information to help them. In any case, the likely causes for this check engine light concern are a VCT solenoid that is stuck, or has debris clogging it's oil passage, or the camshaft advance mechanism may be binding. I have also seen cases where the oil pressure was too low or the oil was just too dirty. The light can be cleared easily enough with any scan tool, but the concern will likely cause the light to come back on over time. If the problem persists you may eventually have concerns such as a rough idle, reduced power or stalling. You could try changing the oil and resetting the Ford engine light to see if the concern returns, and if it does I would recommend having the TSB testing performed by a Ford dealer to pinpoint the issue. In any case I would get a copy for yourself just so you can become a little more educated on the procedures that will need to be done. I hope you found this information helpful! Please let me know if there is anything more I can do to help! Have a great evening! I have a 1996 Ford Explorer. How do I turn off the Ford engine light? Thanks for submitting your Ford engine light question. The light can be turned off easily enough with a scan tool, but we don't recommend this as a permanent repair. The light is designed to come on as a warning that there is a problem with the Electronic Engine Control (EEC) system. The problem may not necessarily cause the vehicle to run poorly now, but certain conditions, such as running lean, can cause damage over time that would otherwise go undetected without the check engine light. It's possible that the light is coming on for something as simple as the gas cap having been left loose, which will not pose any immediate or long term problems. All things being equal, it's best to at least have the computer checked for codes and get an idea of why the light is on. From that point you can make a judgement as to what course of repair to take (if repair is even required). Many shops will perform a free code check, and can clear the codes at the same time. If the problem is a hard fault, the light will come right back on. If it is an intermittent concern, or a concern that is only detected during a system self check (monitor test) then the light may come on after a short time. Either way at least you'll know what system the problem is in, and if it requires any immediate attention. Once you have a code, let us know what it is and we will follow up with possible causes, and what can be done to take care of the problem. Hope this Ford engine light info has been helpful, and certainly let me know if I can be of any further assistance. Have a great day! I have a 1999 Ford Windstar and have scanned for and received Ford engine light codes P0171 - System Too Lean (Bank 1), and P0174 - System Too Lean (Bank 2). I also have a P0401 - EGR Flow Insufficient.I have changed the EGR valve, oxygen sensors front and back, and the mass airflow sensor and the codes are the same, what is the next step? Thank you. Hello and thanks for submitting your Ford engine light question. I would like to start by recommending two of our more popular articles. The first addresses some common repair issues, and can be found here, the second discusses how to approach oxygen sensor codes and can be found here. I think these may both prove useful with future Ford engine light concerns. Now on to the PO171 and P0174 codes you have. From my experience it sounds most like a vacuum leak in the air intake system. Give your local dealer a call and ask for a copy of Technical Service Bulletin (TSB) 03-16-1. This covers known concerns with these particular Ford engine light codes on this vehicle. In a nutshell, the front valve cover has been redesigned to stop oil from entering the vacuum lines, which causes them to swell and fit poorly. Primarily it is the fuel pressure regulator vacuum line that loosens or comes off at the intake manifold, so check this first. There are also updated isolator bolts to secure the upper intake manifold. The manifold gaskets will need to be replaced as well. While the intake manifold is off, the EGR orifice holes will also need to be inspected and possibly cleaned. These repairs are fairly straight forward and should definately help. Either way, check out the TSB to get a little more familiar with this Ford engine light repair. I would also recommend checking out our article on EGR System Concerns for help with the DPFE sensor, and also call the dealer and have them run your vin number as there may be a recall on this. Hope this helps, and let me know if you need any future help with a Ford engine light! I have a 1999 Ford Explorer. The car doesn't start and when I retrieve codes I am getting a P1260 - Theft Detected, Engine Disabled. What can I do about this Ford engine light code? Thanks for contacting us with your Ford engine light question. P1260 indicates that the Passive Anti Theft system (PATS) detected a "theft condition". This basically means an incorrect signal, or no signal at all was received from the chipped key. Brief overview: your ignition key has a chip in it called a transponder that is read by the PATS transceiver (mounted around the ignition cylinder housing behind the column shroud). The signal is then sent to the PATS control module, which communicates with the Powertrain Control Module (PCM) and enables the vehicle to start. Sorry for all the acronyms! When an incorrect signal is received, the PATS module then sends this message to the PCM which triggers the P1260 trouble code, resulting in a no start condition. Possible causes are: an incorrect key being used, faulty key chip (transponder), wiring concerns between the transceiver module and PATS module, the transceiver module itself or internal PATS or PCM module concerns. The first thing to do in this instance is retrieve codes from the PATS module and diagnose these. Once the PATS issues have been resolved you can reset the P1260. Communication with the PATS module will likely need to be done at a Ford dealer. A few things to check first: make sure the correct key is being used, and if you have a second key, try that one as well. If one key starts it but not the other, you may have a faulty key. If both keys do not work, then it is not likely a key problem. Honestly, we see very few problems with the keys themselves. Make sure no one has tampered with the steering column shroud as the transceiver module located behind it is fairly fragile. Lastly check for an aftermarket remote start system. These are a common cause of no start problems with PATS equipped vehicles. Some installers will remove the chip from your key and tape it to the column (under the shroud). This basically bypasses the system and allows it to be started without a chipped key. The problem is that the transponder removed from the key is not designed to be used in this way and can fail due to extreme temperature changes and, depending on mounting condition, excessive vibration and shock. Other installers use a "key box" installed under the dash, and these have been known to cause issues as well. If you suspect the concern to be related to a remote start it may not be a bad idea to have it checked or removed to complete diagnosis. I hope this information has been helpful. Let me know if you need further assistance or clarification on any of this. Have a great day! Hi, I drive a 2004 Ford Excursion Diesel. Last month my heater began to not work properly. I had plenty of air but not much heat. It was warm when I drove 70 mph though. Then no heat no matter how fast I drove. I took it to a Ford Dealer who charged me $182.50 to unpinch a vacuum line. No parts were replaced. But when I drove off I smelled just a hint of antifreeze for just a short time. Just before Christmas the heater began to malfunction in the same way. Christmas day, on our way back to Dallas from NE Oklahoma, the RPMs would not drop from 2000 when driving 65mph (normally would fall to about 1500) and the heater quit heating completely and occasionally we could smell antifreeze. We looked under the hood and all appeared fine. An hour and half later, the engine began to heat up and the Ford engine light came on. We drove 7 miles to the nearest place to stop and raised the hood. There was antifreeze (looked like dirty Miracle Whip) spewed everywhere. We had it towed 99 miles to the dealership again. They said that the vacuum hose had nothing to do with current problem but the problem was an EGR regulator. When I read your information it sounds very much like the two are connected. They said parts alone were more than $1600. It was supposed to be today but they called and said lots of flushing needed to be done. What is your opinion and is there anything I need to check on? Thanks for contacting us with your Ford engine light question. I can offer some advice. First, I would try to get a better definition of the exact problem. I am presuming this is the 6.0L engine. I have seen a couple of instances where the EGR cooler itself leaks. This is a steel tube with coolant tubes and fins (like a mini radiator) inside it. The exhaust gases going through this tube are cooled by the engine coolant before entering the engine. If this cooler starts to leak it can exhibit symptoms similiar to a leaking headgasket. Coolant loss will result which can cause symptoms such as no heat, odors and eventually overheating. Check with your service advisor to see if this is the failed part. If so, then it sounds to me like they may have misdiagnosed or missed this the first time around. A pinched vacuum line will not result in coolant odors or any loss of coolant. Between diagnosis and replacement of this component you should be looking at about half a days work, and no time should be required for "flushing". This component may be covered under the base engine diesel warranty which is up to 100k miles, so ask about this. If coverage is denied I would ask for the diesel base engine warranty parts coverage list for your own records. I hope this info is helpful, and let me know how you make out. Thanks, and let me know if you have any future Ford engine light concerns! F150 Forum - Ford F-150 enthusiast site offering a discussion board, pictures, specifications, news and more.